If you’re like me, you hear the words “maxi skirt” and automatically think summer – after all, a maxi skirt and t-shirt are practically my warm-day uniform. And why not? Maxi skirts are easy pieces to wear, keeping you cool on a hot day. However, before you put away your maxi skirts for the fall and winter months, consider maximizing this summer staple with a few fresh pairings and some warmer footwear. Simply return your flip-flops securely to your closet, then seamlessly transition your maxi dresses into fall favorites, preventing the need to overspend on a new fall wardrobe. If you don’t have a maxi skirt yet, it’s a worthy investment that can extend your wardrobe. Because it’s a skirt, you can wear it for more formal occasions, or dress it down for lunch with friends. If it sounds too good to be true, here are several fresh ways to style your maxi for fall. The best part is that none of these pieces cost more than $50, so you get the most bang for your buck while going from lazy summer days to crisp autumn afternoons. Chambray is a big-time summer fabric, thanks to its airy texture, but it’s such a workhorse that I hate to put my chambray shirts away when colder weather blows through. When paired with a maxi skirt, the chambray shirt suddenly becomes an obvious pick for a cute lunch outfit or a casual movie date. While this maxi skirt has a traditional summer pattern, by adding more fall-appropriate textures – such as leather and metallic – it transforms into a fall-appropriate ensemble. If you’re feeling a little chilly, you could add a weathered leather jacket or a comfy knit cardigan. Unless you work in a very casual office, maxi skirts and flip-flops are a no-go. But when paired with office-appropriate duds, you can make a maxi skirt look more professional. I love wearing mine with a tailored boyfriend blazer – roll up the sleeves and go for a preppy color pairing, such as navy and pink. Add closed-toe shoes and a bag big enough to fit your work files and lunch, and you have a professional-looking ensemble that is extremely comfortable. Pattern-mixing is an awesome way to play up textures and look more fashion-forward. The problem is that the trend can be tricky. My rule of thumb is to choose two patterns that have the same color scheme, such as black and white. 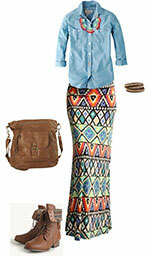 Since this skirt and scarf share the same color scheme, the mixed patterns aren’t competing. I also love that the maxi skirt’s pattern has a winter vibe, giving it a cozy feel. Top your outfit off with a moto jacket for an edgy look that’s perfect for practically any occasion. If you’d rather not spend a fortune on holiday party clothes you won’t wear often, your old standby maxi skirt can be a pinch hitter for pricier duds. The secret to really dressing up a maxi is to use rich colors and metallic textures to make it look more like formal wear and less like a beach coverup. I love a monochromatic color scheme and lots of layered gold chains to tease richness out of a deep maroon, but this look would work equally well with other colors such as navy, brown, and even emerald green. 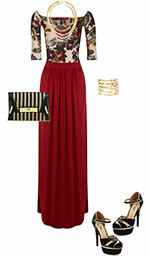 Add a clutch and a pair of fancy heels, and you’ll be ready to hit a holiday party without spending a ton of dough. When you think of fall, you automatically start dreaming of cozy knits, mugs of warm cocoa, and time spent with family and friends. Your maxi skirt can be worn at home on Thanksgiving Day as easily as it can when you’re out holiday shopping for your family. Look for chunky knits and Aztec patterns, two trends that are making a big splash on the fashion scene. Just make sure that as you layer, you keep your tank or t-shirt on the thin side – limiting yourself to only one chunky fabric at a time. Finish off the look with some slouchy boots, and you’ll be ready to order that pumpkin latte you’ve been craving. You might not have a lot of cash to spend on a new fall wardrobe, but that doesn’t mean you can’t enjoy a fall update by mixing up what you already have. By swapping flip-flops for boots and tanks for crisp button-ups and cozy cardigans, you can transition that super-comfy maxi skirt from the beach to the boardroom. Do you have any great ideas for wearing your maxi this fall?